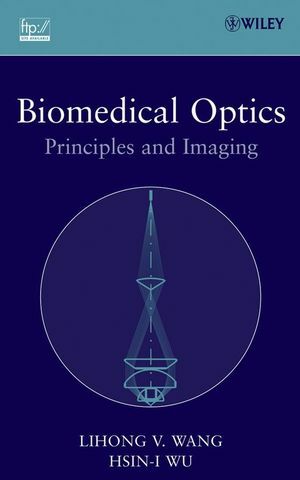 This entry-level textbook, covering the area of tissue optics, is based on the lecture notes for a graduate course (Bio-optical Imaging) that has been taught six times by the authors at Texas A&M University. After the fundamentals of photon transport in biological tissues are established, various optical imaging techniques for biological tissues are covered. The imaging modalities include ballistic imaging, quasi-ballistic imaging (optical coherence tomography), diffusion imaging, and ultrasound-aided hybrid imaging. The basic physics and engineering of each imaging technique are emphasized. A solutions manual is available for instructors; to obtain a copy please email the editorial department at ialine@wiley.com. Lihong V. Wang, PhD, is Gene K. Beare Distinguished Professor in the Department of Biomedical Engineering and Director of the Optical Imaging Laboratory at Washington University in St. Louis. Dr. Wang is Chair of the International Biomedical Optics Society. His?Monte Carlo model of photon transport in biological tissues has been used worldwide. He has published more than 120 peer-reviewed journal articles and patents. HSIN-I WU, PhD, is Professor of Biomedical Engineering at Texas A&M University. He has published more than fifty peer-reviewed journal articles. Dr. Wu was a senior Fulbright scholar and is listed in Outstanding Educators of America. He serves on the Editorial Advisory Board of Biocomplexity and the Editorial Board of BioMedical Engineering OnLine. 1.2.General behavior of light in biological tissue. 1.3.Basic physics of light-matter interaction. 1.4.Absorption and its biological origins. 1.5.Scattering and its biological origins. 1.6.Polarization and its biological origins. 1.7.Fluorescence and its biological origins. 2. RAYLEIGH THEORY AND MIE THEORY FOR A SINGLE SCATTERER. 2.2.Summary of the Rayleigh theory. 2.3.Numerical example of the Rayleigh theory. 2.4.Summary of the Mie theory. 2.5.Numerical example of the Mie theory. 2.6.Appendix 2.A. Derivation of the Rayleigh theory. 2.7.Appendix 2.B. Derivation of the Mie theory. 3. MONTE CARLO MODELING OF PHOTON TRANSPORT IN BIOLOGICAL TISSUE. 3.7.Appendix 3.A. Summary of MCML. 3.8.Appendix 3.B. Probability density function. 4. CONVOLUTION FOR BROADBEAM RESPONSES. 4.3.Convolution over a Gaussian beam. 4.4.Convolution over a top-hat beam. 4.7.Appendix 4.A. Summary of CONV. 5. RADIATIVE TRANSFER EQUATION AND DIFFUSION THEORY. 5.3.Derivation of the radiative transport equation. 6. HYBRID MODEL OF MONTE CARLO METHOD AND DIFFUSION THEORY. 7. SENSING OF OPTICAL PROPERTIES AND SPECTROSCOPY. 8. BALLISTIC IMAGING AND MICROSCOPY. 8.8.Radon transformation and computed tomography. 9.3.Coherence length and coherence time. 9.5.Fourier-domain rapid scanning optical delay line. 9.9.Monte Carlo modeling of OCT.
10. MUELLER OPTICAL COHERENCE TOMOGRAPHY. 10.2.Mueller calculus versus Jones calculus. 10.6.Mueller matrices for a rotator, a polarizer, and a retarder. 10.10.Jones matrices for a rotator, a polarizer, and a retarder. 10.11.Eigenvectors and eigenvalues of Jones matrix. 10.12.Conversion from Jones calculus to Mueller calculus. 10.13.Degree of polarization in OCT.
11.2.Modes of diffuse optical tomography. 11.7.Frequency-domain theory: linear image reconstruction. 11.8.Frequency-domain theory: general image reconstruction. 11.9.Appendix 11.A. ART and SIRT. 12.6.Delta-pulse excitation of a slab. 12.7.Delta-pulse excitation of a sphere. 12.8.Finite-duration pulse excitation of a thin slab. 12.9.Finite-duration pulse excitation of a small sphere. 12.13.Appendix 12.A. Derivation of acoustic wave equation. 12.14.Appendix 12.B. Green's function approach. 13.2.Mechanisms of ultrasonic modulation of coherent light. 13.4.Frequency-swept UOT with parallel-speckle detection. 13.5.Ultrasonically modulated virtual optical source. APPENDIX A. DEFINITIONS OF OPTICAL PROPERTIES. APPENDIX B. List of Acronyms.